In the past, I’ve blogged about how to set workflow item_types so they can be purged using scripts in $FND_TOP. One such script is wf_purge.total. Below, I give an example of using wf_purge.total to item_types where the PARENT_ITEM_TYPE is null. I also write about two methods to purge notifications, wf_purge.notifications and manually updating the wf_notifications table and set status=’CLOSED’, mail_status=’SENT’, and END_DATE=sysdate-1. This blog also introduces using the WF_ITEM_ACTIVITY_STATUS.Create_Status procedure to set the status to ‘COMPLETE’ from ‘NOTIFIED’. This can be used to change the status. Queries used to find WF_ITEMS that can’t be purged. It turns out the biggest offender was FAFLEXWF (41 million rows), because of a custom portion of the workflow for cash management had an error. The next item_type with the most issues was WFERROR. This is very common. The problem with resolving WFERROR item_types, is you need to know the item_key, based on some criteria. For example, we had nine wf_notifications where the message_type=’CREATEPO’ and the status was not ‘CLOSED’ or the mail_status was not ‘SENT’ or there was no end_date. Oracle is working on a big upgrade to its e-business suite in 2019. Or maybe 2020. That’s what senior veep for application development Cliff Godwin told the Red Rock Oracle Leadership Forum* in Sydney, Australia, today. 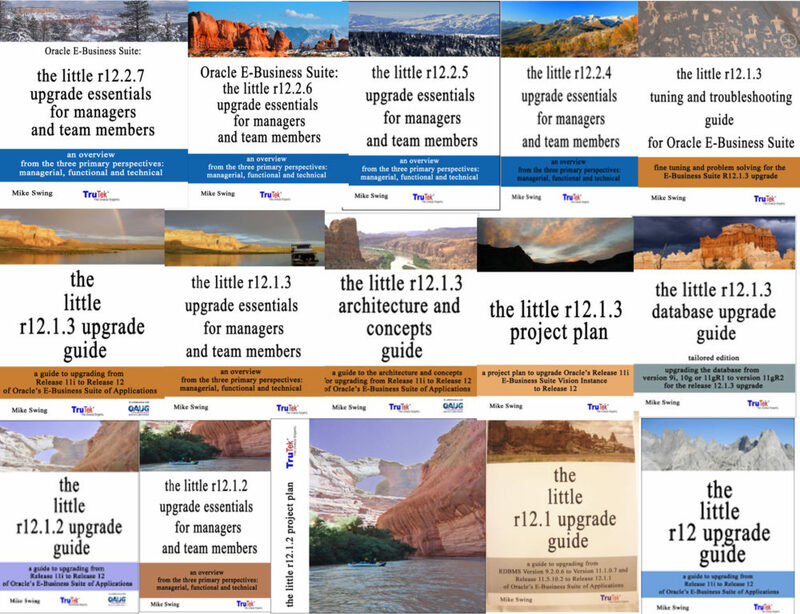 The suite is currently on version 12.2.6 and Godwin said Oracle plans just-about-annual double-point releases for the next couple of years to bring it to to version 12.2.7 and 12.2.8. The release after that will be 12.3 and while Godwin couldn’t say what would be in it, he did say that Oracle has already guaranteed support for it until the year 2030 and beyond. Big Red’s made that pledge to ensure users don’t feel their on-premises applications are in peril, or that they’re being herded to the cloud. Godwin said Oracle knows it has plenty of customers, many of them in military or other sensitive government fields, that are likely years or decades away from being comfortable in the public cloud. Oracle’s double-point updates, however, don’t add a lot of functionality to the suite and the company’s current plans see most of its innovation focused on software-as-a-service (SaaS). Godwin said on-premises users will be able to access new functions by piping in those new SaaS offerings. “They will work as if we built them as new modules,” he said. Among the new SaaS offerings Oracle is working on is predictive analytics it will bake into its asset management modules. A new in-memory cost management cloud service replaces an on-premises product that Godwin said was “very computationally intensive” and required users to acquire an Oracle Engineered system. The new SaaS version does away with the need for the tin, but gives you access to an evolving piece of software. In 11i, R12.0 and R12.1, we can use adpatch apply=no to apply a patch in test mode. In test mode, AutoPatch does not apply the patch. Instead, it lists each file it would have copied, relinked, executed, or generated and shows exactly what actions it would have performed had it applied the patch. It also runs AutoConfig in test mode to determine any impending changes to the configuration files. This allows you to see the effects of the patch on your production system before you apply it. To run AutoPatch in test mode, include apply=no on the AutoPatch command line. This runs as if AutoPatch is applying the patch, except it does not. In R12.2, we can use adop with apply=no, since most of the options and flags that are valid for adpatch are valid for adop. REM Spool results to adzdcmped.out file. Developers often use the user_objects or all_objects data dictionary view to confirm that there are no unexpected invalid objects. Due to a database limitation these dictionary views only return correct object status after running a full compilation procedure (utl_recomp.recomp_parallel or ad_zd.compile). As a workaround, you can check object status using the ad_objects view included with online patching. So, what’s the difference between ad_objects and dba_objects? Of course, we can do it an easier way and compare VIEW_NAME and TABLE_NAME in DBA_EDITIONING_VIEWS and do a “count” to see if the result agrees with the results from above. Or, select table_name where the view_name doesn’t exist. Or, use the Section 20 SQL from ADZDDBCC.sql to find tables that don’t have an editioning view. In order to patch custom tables using online patching, custom tables require an editioning view and APPS synonym. The following SQL will find tables that may not have an editioning view. – P2: These tables may not be patched using online patching. – Fix: Execute the table upgrade procedure. Note: Tables that are dynamically created by application runtime can be ignored. Note: Tables that end with “_A” are typically audit tables by the Audit Trail feature, and can be ignored. Note: This check is only active after Online Patching Enablement. Notice the ORIG_PATCH_NAME is a surrogate number instead of the old convention of “merged”. We’ve just finished two successful Release 12.2.6 First Pass Upgrades in the last six weeks. We always encounter and resolve a few unique issues with each client. Here are two examples. The first issue occurred while running Patch 10124646 (the 12.2.0 upgrade patch), and the second occurred after running that patch. FAILED: file CustMigrationTool.class on worker 1. FAILED: file CustMigrationTool.class on worker 2. FAILED: file CustMigrationTool.class on worker 3. FAILED: file CustMigrationTool.class on worker 4. FAILED: file EDRXDOMigration.class on worker 5. FAILED: file CustMigrationTool.class on worker 6. FAILED: file CustMigrationTool.class on worker 7. FAILED: file CustMigrationTool.class on worker 8. FAILED: file CustMigrationTool.class on worker 9. However, that was not the only solution that was required. It turns out that using Recommended Patch Collections (RPC) creates objects that have a higher version than objects delivered by the 12.2.0 upgrade. This means the 12.2.0 upgrade will not replace objects with a higher version number and the upgrade fails. We had to find the correct versions of the code that worked together and then drop a trigger in order to get the FND_TRACE package body and specification to compile. Very interesting. 2. When running the “Configure the Instance” step, we couldn’t run AutoConfig on the database tier. This step is from the “Finish the Upgrade” section of the 12.2 upgrade guide on page 3-8. We found MOS Doc. ID: 2117174.1, 12.2 Adop Cleanup Fails with Error “ETCC not run in the Database Node” After Running ETCC on the Database Node. Email sherri@trutek.com to discuss pricing or schedule a time to have us help you with a First Pass Upgrade. We have completed the First Pass Upgrade in as few as three weeks, but it can take longer if we experience new issues. Please see our webpage for more information about our First Pass Upgrades consulting engagement. We also provide training to the rest of your managers, DBAs and development staff to help them understand the best practices of Online Patching. Use adop phase=prepare sync_mode=delta. Sync_mode=delta is a new feature delivered in AD-TXK Delta 8. It is much faster than the previous sync_mode = patch. The new sync_mode=delta takes about 4-10 minutes on TruTek test servers. If the previous patch cycle was aborted, then FS_CLONE is run during the next prepare. The prepare phase can fail due to long running concurrent requests that are incompatible with the ADZDPATCH concurrent program. We tested three apply modes: normal (default), hotpatch and downtime. We found that downtime patching works, but the system must be down and the patch needs to be tested first in a test environment. Using hotpatch when the patch is not a hotpatch can result in a hung patch that can’t be aborted and can also cause an abandoned node. Neither downtime or hotpatch mode use an adop patch cycle and therefore cannot be aborted. Hotpatch mode requires the WebLogic Admin server to be running. Finalize prepares for the cutover by compiling invalid objects. This helps reduce the time cutover may need. Any underlying code changes that affect tables, materialized views, and other objects may require the regeneration of logical views for tables, and regeneration of materialized views. The regeneration of materialized views from logical views is accomplished fairly quickly, however, repopulating the materialized view can take hours. I don’t think it is possible to prevent the regeneration of MVs, but we need to be able to predict the time it will take to regenerate MVs and other objects, so we can accurately advise the users/business of the downtime associated with each cutover. The running concurrent requests need to be documented before we shutdown the concurrent managers. The ICM must also be shutdown. Otherwise, the cutover can take several hours to complete. This is because cutover waits for running concurrent requests to complete. It’s better to work with the business users and ask them to put long running requests on hold, before cutover starts. We tested the cm_wait parameter (units are minutes). We found that no new requests were started, but the Internal Concurrent Manager is not shutdown/stopped. It took a long time for associated database sessions to be terminated. Cleanup If a patch cycle has failed, it is possible to abort the patching cycle and return to normal runtime operation. Abort can be run for Prepare, Apply, Finalize, and Cutover phases. The abort command can only be used before successful completion of the cutover phase. After cutover, the system is running on the new edition, and abort is no longer possible for that patching cycle. An abort of prepare, apply or finalize, if complete on the master node and it fails on a slave node, will cause an abandoned node. There are two solutions: first, detach and re-attach the abandoned node. This can be very time consuming. If you have a “pairsfile” created ahead of time this can be done fairly quickly. There is also a solution (undocumented on MOS) that has worked in all test cases, that requires shared disk on the apps tier. This solution is an update to the AD_ADOP_SESSIONS table, followed by an FS_CLONE. This phase seems to be the easiest, and the patch session will determine if the cleanup needs to be standard or full. You can specify quick, but we’ve found it’s safest to let the cleanup determine what mode to use. If the proper mode is not used, then cleanup may be run during the prepare( followed by a fs_clone), extending the time for prepare. The table below shows the major comparable steps in the 11i to 12.1.3 upgrade and the 12.1.3 to 12.2.6. The highlighted sections in the 12.2.6 upgrade indicate the new steps relative to past upgrades. These new sections, while they don’t take very long to complete during the downtime window, require extensive effort to prepare the instance for the upgrade. For example, the more customizations you have, the longer it will take to make sure your customizations are minimally compliant to the Release 12.2 development standards. The process of updating your customizations to match new table structures is still a major part of fixing your customizations, but now you must also make sure your customizations are at least minimally compliant. The second new step highlighted below requires your database (DB) and middle tier (MT) to be patched to a level specified in the ETCC scripts, checkDBpatch.sh and checkMTpatch.sh. While these scripts are easy to run, it’s not always straightforward to resolve patch conflicts in the database or the middle tier. This step is complicated because the list of required patches is continuously changing. It’s not so much that these new steps are difficult, but they are new and different from all previous upgrades and take some time to understand and implement.